Our handcrafted Amish Angled Canted Hutch is the perfect piece for your dining room area and features a unique angled design. 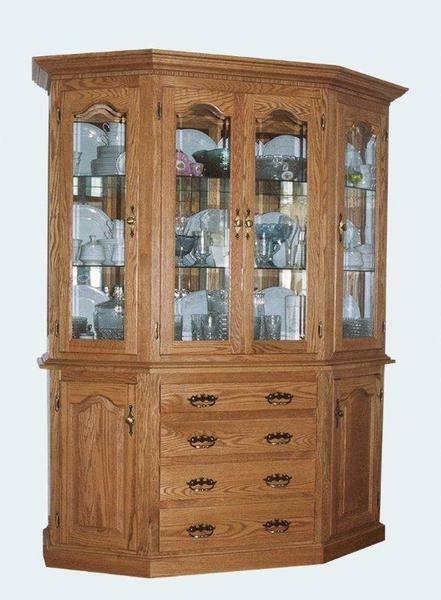 This beautiful angled hutch makes an elegant addition to any home and is proudly made by authentic Amish craftsmen right here in the United States. Choose your wood and finish type for a custom look that will complement your dining room perfectly. Our friendly Amish furniture specialists can answer any questions and assist with custom orders on this handcrafted Amish Angled Canted Hutch. We can also have wood and stain samples sent to your home or business to help make your decision process a bit easier.